Thanks to a heads up from our contributor - Sapere-aude - I caught this small development down in Bolivia. The newly elected president held true to a campaign promise (is this a first for a politician?) that he would cut his salary in half. In fact, he cut it by 57% to about $1800 per month. Morales also urged the Congress to cut their salaries as well, as by law in Bolivia, nobody in the government can earn more than the president (this according to a BBC article). He said that the money would be used to increase the number of doctors and teachers in the country. Check back, as recycled minds will continue with updates on further developments in Bolivia, Latin America, and beyond. Here's a link to a BBC article that tells of the paycut. 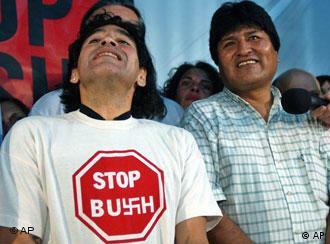 And how about this photo of Evo Morales (on the right) with superstar soccer player, Diego Maradonna, wearing a classic t-shirt with a message that has huge support around the world. Chavez downplayed Rumsfeld's Hitler comparison. 'Let the dogs of the empire bark, that's their job," he said. "Ours is to battle to achieve the true liberation of our people.'" President Bush 'the North American Hitler' and comparing his administration to the Third Reich." International politics is just crazy. Leaders calling each other Hitlers - which is probably absurd - is really just grade school tactics. Although the Bush regime - even American governments of the past - are probably a bit too close to the Hitler analysis than anyone really wants to admit: the Native Americans, the School of the Americas (training others to commit atrocities), and our many missions of military aggression that have led to the loss of civilian life - all in the name of democracy. Ugh - bring on the socialism. If Chavez is asking for war, he may well get it. It's understood that he is asking for more weapons, I believe enough to have 1 million soldiers armed. The US has had numbers drop drastically for solders. The name calling is ridiculous, especially to throw a name like Hitler back and forth. However, it does get the pulses raising. Chile Adds a Voice for the Left!